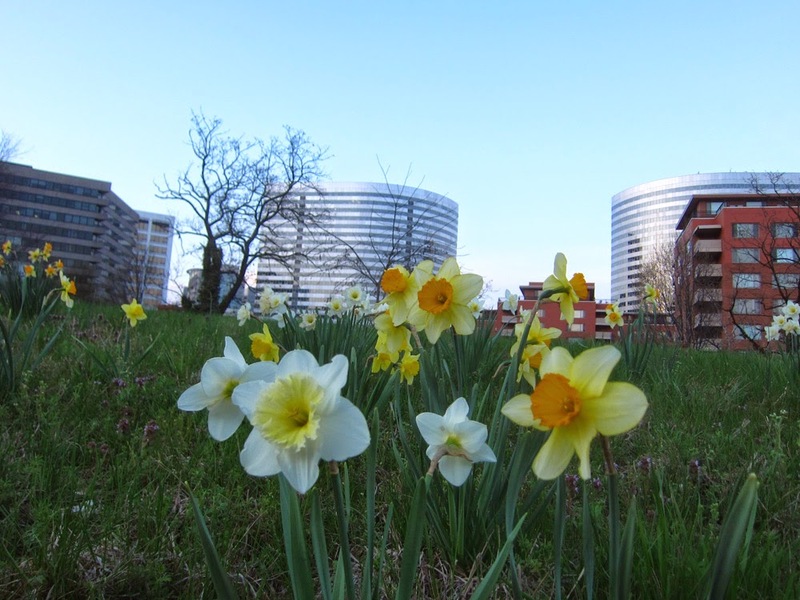 While flower aficionados eagerly await the blooming of Rosslyn's famous Iwo Jima formal flower gardens, wild tulips next to the Rt. 50 entrance ramp to Rosslyn are already welcoming everyone. Rosslyn tends to be associated with urbanity. But if you take the time to get to know Rosslyn, you'll notice a wild side of irrepressible exuberance. There is no such thing as "Wild Tulips". Furthermore, there is no such thing as "wild Daffodils". Daffodils (Narcussys) are bulbous perennials. The plants shown in the picture were planted by someone. The Ode Street Tribune has an outstanding art editor who no doubt knows Salvador Dalí's painting Metamorphosis of Narcissus. Thus had the Ode Street Tribune's art editor been consulted, this error would not have occured. Thanks for identifying the flowers as daffodils. However, the Tribune's years of boots-on-the-ground Rosslyn reporting finds no indication that those flowers were planted there. Moreover, the flowers are numerous, and they are not arranged in any intentional way. The Tribune's art editor wasn't consulted because he is currently preoccupied with finger-painting a self-portrait. Is there a historian or someone interested in history on the staff of the Ode Street Tribune? If so, trying to discover who originally planted those daffodils would be an interesting project. A DNA test might be able to tell someone how old the age of the Rhizomes and that might give a lead to who originally planted the mystery daffodils. The Tribune has published some interesting and wonderful articles on the history of Rosslyn. Discovering "the story behind" those daffodils could possibly earn the Ode Street Tribune's staff historian a Pulitzer prize. Thanks for the suggestion. The Tribune does have on staff a historical investigative journalist. We would also note that the Tribune has already garnered three Putzer Prizes. congratulation of the three Putzer prizes. The story behind these flowers could generate the fourth.